So we've got good, bad and great news for you today... 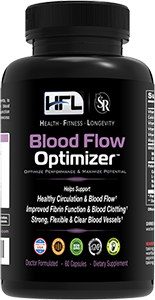 The bad news is that as of today (Apr 24th), Blood Flow Optimizer™ is on back order =( ... We've had a lot of great publicity about this product recently and unfortunately, we couldn't keep up with the demand - thus, have temporarily run out of inventory. Now, the good news is that we'll have new, fresh stock available within a couple of weeks. However, the GREAT news for you is that I'd like to thank you for your patience by giving you additional free bottles + discounts on your next order. Spend less, save more and get even better results! For now, please fill out the below form and you'll be added to our pre-order VIP list. As soon as Blood Flow Optimizer™ is back in stock, you'll receive a private email with your free bottle & discount offers. This is a PRIVATE email list. Offer is limited to one person per household, per email.